Our warehouse is packed with equipment so we need to blowout some models in order to create space for new machines. We have a few units of the Life Fitness 93Ti treadmill and we are putting them on sale for the blowout price of $799. These are all commercial grade models and are in guaranteed working condition. Our mechanics can also service or Remanufacture these machines upon request. If you are interested in this treadmill, please send us an email at [email protected] or call us at 714-957-2765. Deck: Flexdeck™ Shock Absorption System: Reduces knee and joint stress by up to 30% more than non-cushioned surfaces, decreasing the chance for injury. Eight incredibly durable Lifespring™ shock absorbers deliver consistent cushioning. Tread Belt: DX3™ Belt and Deck System. This groundbreaking system combines a lubricant-infused belt, Advanced Belt Tracking System (ABTS™) and our patented FlexDeck™ Shock Absorption System for the ultimate in durability and comfort. Heart Rate Monitoring Technology: Polar telemetry provides runners with accurate, ”hands-free” heart rate monitoring. Handrails: Ergonomically-correct handlebars and siderails. Additional Features: DVD/CD/iPod/Laptop Compatibility: Connect an iPod or DVD/CD player or laptop directly into the Attachable TV (requires additional external cord not supplied by Life Fitness). We have just received a shipment of the Life Fitness 93Ti treadmills. Although it isn’t the newest model, it is new to our inventory so we thought we’d put together a Life Fitness 93Ti treadmill review. We will be breaking down the features and benefits to help you decide if this is the commercial grade treadmill for you. The main difference between the Life Fitness 93T and 93Ti is the heart rate monitor built into the 93Ti. The Life Fitness 93Ti treadmill comes with a deluxe message centre console built in which provides five high quality workout programs. Even though this is a slightly older model it does contain some impressive technology. It comes with a built-in Polar telemetry that automatically adjusts elevation to keep the user in their target heart rate zone. Life Fitness has established itself as a world class leader in fitness equipment due to their intelligent engineering. In addition to the high advanced internal engineering, Life Fitness has also dedicated its time to the aesthetic aspect of their treadmill. The 93Ti in particular has a very streamline and sleek design. This model looks like a commercial grade treadmill and differentiates itself from any home units your find in retail stores. 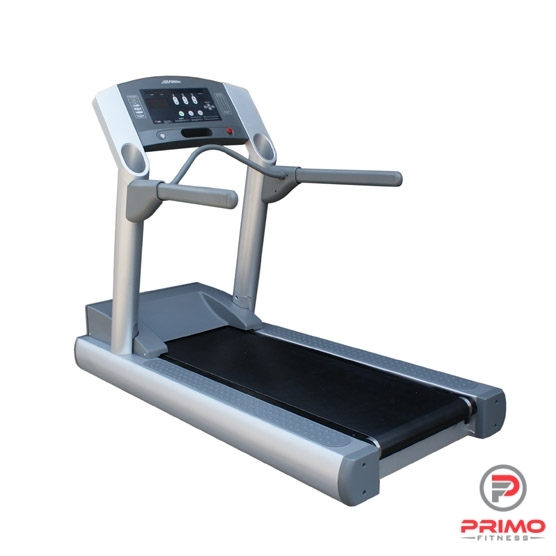 All of the later models of Life Fitness treadmills, including this one, come with a lubricant-infused belt along with their patented FlexDeck Shock Absorption System which creates an extremely durable design. Also included is the Lifepulse digital heart rate monitoring hand sensors that are conveniently placed where you hands normally go when using a treadmill. You basically just grip the ergo crossbar and get precise heart rate monitoring. Controls are very intuitive and easy to use even for people new to fitness. The Life Fitness 93Ti treadmill comes with a 4.0 HP AC motor with a MagnaDrive motor controller that is able to reach speeds of up to 10 miles per hour and a 15% incline. This range of options can satisfy even the most intense fitness fanatics and is able to provide everyone with the workout they want. All commercial grade Life Fitness treadmills come with the standard running surface size of 20”x60”. This is more than adequate to accommodate users of any shape and size during their workouts. The belt comes pre-lubricated and the wax-coated deck has 8 large Lifespring shock absorbers to reduce stress on the user’s joints which helps to prevent injuries. The built in LED console shows users their elapsed time, speed, distance, heart rate, calories, incline and distance climbed so users can easily track their progress. Other information that the console can display is the user’s watts, METs and custom messages meant for motivation. The Life Fitness 93Ti treadmill also comes with a reading rack to place magazines or books on, an accessory tray to hold bottles, stereo holders for the user’s musical devices. This is not the most recent model of Life Fitness commercial treadmills but it is new enough that it has all the great technological features. If you want a high end, beautifully designed treadmill and are content with not having a top of the line model, the Life Fitness 93Ti would be perfect.